Sparkles, seasonal treats, and Chewbacca, too, are due. 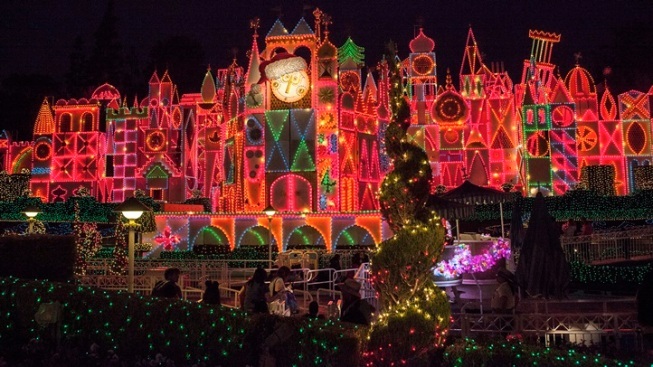 HOLIDAY TIME... at Disneyland and Disney California Adventure, which opens on Friday, Nov. 13. As always, the wreaths and bows will be out, and the handmade candy canes at Candy Kitchen, and the toy soldiers in the A Christmas Fantasy Parade. The Jingle Cruise'll throw in some yuletide touches, and the Haunted Mansion Holiday -- complete with Jack Skellington, Zero, Sally, and "Nightmare" crew -- is still gingerbreading up the New Orleans Square spookhouse. Santa Claus will also call upon Critter Country, if you'd like an audience with Mr. Kringle. AS FOR THE OTHER NOVEMBER ARRIVAL... at the park? Why a new "Star Wars" experience called "Season of the Force" opens on Nov. 16, bringing with it opportunities to say hello to characters from the universe and "a twist" on the Jedi Training. Also? Space Mountain is transforming into Hyperspace Mountain in honor of the opening. OF COURSE... now we're really and truly thinking the Imagineers might be building a telescope on the surface of the moon, both to admire the lights of it's a small world at Christmas and because space, in the form of "Star Wars," is a central theme of the upcoming season at the world's most famous theme park.